To me, giving up cheese and ice cream has been the hardest part of converting to veganism. There are some commercial vegan ice cream options out there that are pretty delicious, but the products tend to be very processed. I’ve also been interested in creating my own vegan cheeses, but a lot of the recipes that I have seen appear to be pretty complicated. “The Best Homemade Vegan Cheese & Ice Cream Recipes” by Marie Laforet, offers colorfully pictured, well-described recipes that make the process appear easy. There is a wonderful variety of choices as well. The cheeses range from the basic options like feta and mozzarella to attractive potluck worthy selections such as a Soft Cheese Log or Oven Baked Almond Cheese Rounds. With this cookbook, I feel like once I learn the basics, I will be able to venture out and come up with my own creations, without accidentally killing anybody! Then there are the desserts! The ice cream section is definitely not to be viewed while hungry, because you will find yourself drooling, and your stomach growling! In my efforts to avoid processed foods, I’ve been skipping the commercial vegan ice creams and simply grinding up frozen bananas and cocoa powder to make my own “nice cream.” This gets kind of old after a while. Now I can create my own frozen treats such as ice creams, sorbets, and pops. The first one I am going to create is the pistachio ice cream. That has always been my favorite and now I can create it guilt free! The pops are beautiful and would make healthier options for children. 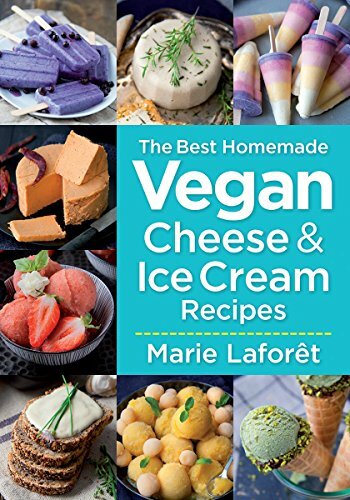 “The Best Vegan Cheese & Ice Cream Recipes” book by Marie Laforet provides me with some excellent choices that will help me grow my culinary skills. Now I can be known for more than just my fantastic vegan, lactose free, and gluten free salads at potlucks. I look forward to doing some experimenting and waiting for reactions. I’ve discovered that when I offer to bring a vegan, lactose free, gluten free dish to a potluck, the hostess is usually relieved that there will be something there to cater to special diets. This approach has helped me avoid the judgmental vegan comments from the guests. With the recipes in this book, I think everybody will appreciate the treats that I bring. This book is highly recommended for vegans, vegetarians, lactose intolerant and gluten free diets.